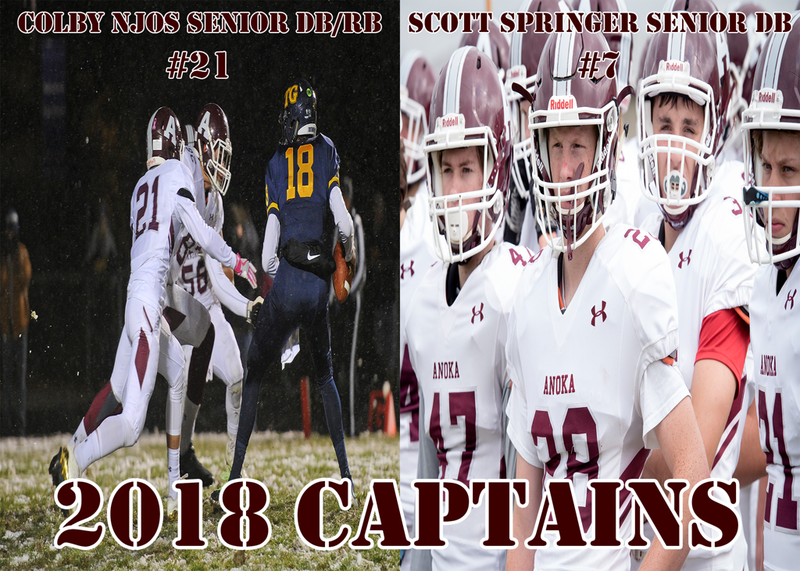 Colby Njos, and Scott Springer have been named captains for the 2018 Anoka Tornado football team. Both young men have shined in the classroom, community, and in multiple sports for the Anoka Family. They will join current captains Joey Lombard and Godo Jiggo in leading the team this fall. Colby is a high level wrestler with multiple awards and accolades along with starting multiple games as a Junior last season. Scott is also a wrestler for the Tornadoes and also golfs in the spring. Scott is the son of Todd and Angie Springer and Colby is the son of Matt and Mandy Njos. ©2019 Anoka Football / SportsEngine. All Rights Reserved.